I bought this detector second hand as a back up to my MXT, and I thought I would probably use it only on the beach, but I LOVE this unit, and will probably never use my MXT at the beach again. I found more stuff in one day at the beach with this unit than 5 days with my MXT, and super deep. I give this machine the highest marks available and will continue to use this one for years to come. Hope this helps if you are looking for a great beach detector. White's Surf Pro is the best!! I have been land hunting for years and just bought the Whites Surf Pro one week ago.I played with it in the yard and was finding all kinds of cool things but the first time I took it to the beach it paid for itself!! they were two old saltys using Excal's in front of me and I was just there to practice with it,well soon I was finding more stuff than the Excal's!! First time findings 1) engagement ring 2) 3.00 of change.25 pull tabs.LOL. If your looking for a great detector for a great price you cant go wrong.I researched all the name brand detectors for 2 months before choosing the Whites.Its as easy to learn,set up, and use as a begeinner but far more superior than the more expencive brands. Depth-deeper than you want to dig.LOL if you go past the factory pre set mark. (I dug 3 dimes and a quarter at about 20" at the waterline.everything else was 6"-13" in dry sand. The resale value's are great too,I look on ebay and they were selling for around 500.00 avg.USED!!! New is 594.00 with free shipping to your door plus freebies!!! It's definitely a metal detector. It finds everything from ketchup wraps, aluminum tabs, bottle caps, iron, coins and jewelry. And guess what they all sound the same! If you don't want to miss anything this is the detector for you, however if you don't like digging- forget it. Definitely does what it says it does. Great in salt water. Why Didn't I Buy One Years Ago ??? Seven years ago I purchased a Fisher CZ20. I sold it in April of 2006. Don't ask me what I was thinking. I purchased a Whites DFX and took it on our annual family vacation on the 4th of July in Destin Fl. On the first day at the beach, The DFX preformed good on land however, I was very nervous taking the machine near the surf. I was even nervous about getting sand in the circuit box, so I decided to leave it in the room. Day 2 of our vacation while watching the surf and the kids playing in the sand I noticed a guy detecting in about chest deep of water. He came out of the water with an older gentlemen in his late 50�s. The gentlemen walked him over to his umbrella and reached in his wallet and gave the guy $100. I could no longer resist so I walked over to where the guy that was metal detecting and ask him if he had any luck. He reached in his pouch and should me 2 gold rings he had found and he told me the older guy had lost his wedding band in the water and asks the guy if he could help find his ring and he did. I noticed the detector was a Whites Surf PI Pro. The guy went on and on about how much he loved the machine. I could not resist. I walked over to my wife who also witnessed this guys finding and told her I had to get another water machine. I could not stay at the beach for the next 8 days without one. She thought I was crazy but she said if I insisted go ahead. I found a local metal detector shop near Destin and purchased a Whites Master PI Pro for $600. I was a little skeptical at first trying to compare it to the Fisher CZ20. The CZ20 was a workhorse. As soon as I took the Whites down to the beach I instantly fell in love with its simplicity. I found the Whites to be very easy to handle unlike my CZ20, which was very bulky and hard to swing without having the unit strapped to your hip. I also noticed the Whites Surf master was a lot more sensitive than the CZ20 and had a much deeper penetration than the CZ. By the end of the vacation I had found a gold band and several pennies, nickels, quarters and dimes. I still found a lot of trash however, the Whites kept impressing me with how deep it would detect. I will not try to blow smoke and tell you I found the jackpot, but I found this detector to be quite a machine. I would recommend this machine for a beach hunter any day of the week. I realize now everyone should own two machines, one for the surf/water and one for land with more discriminating features. I was very depressed and thought I had made a big mistake when I sold the CZ20 unit I purchased the Whites. Lesson learned and I will not make the same mistake twice with the Whites. I hope this helps in deciding which water machine to go with. I had read all the reviews myself and have found them very helpful. Anyone in the market for a water machine really needs to give the Whites Surf Master Pro a good look. By the way, I also told my wife I might purchase another one and leave it in the box as a back up some day just incase Whites decides to replace this model with another one. After reading every review I could find, I decided I wanted to find my treasures in the ocean and chose the PI Pro. This detector finds it big or small. I do believe I have dug up every bottle cap and can tab made. This machine has a solid tone when it finds metal and I mean all metals. I do not say this in a bad way knowing what I purchased the PI Pro for, doing exactly that. When you hear that solid tone, dig it all. I have had great beginers luck, rings, coins, chains etc., right in the shore line in 1 to 3 feet of water. This is a metal finding machine. Have fun!!!!! I just purchased the whites surf master pi pro I have had great luck with coins and rings. I had the prizm 2 for two months and only found two rings in that time period. I have now found 13 rings and numerous other finds including a white gold 14 k chain w / a white gold ring attached. A few silver rings one with a nice heart shaped sapphire and a pin point diamond to the left side of the ring. Only thing is im getting a thorough work out because of no! discrimination. well it's good and bad. I Recently purchased the PI Pro by Whites. I Currently already owned the Garrett Master Hunter CX III , BH Quick Silver and the old Garrett Deep Seeker and Ground Hog T/R . The first thing I noticed was the incredable depth of the PI PRO . Very sensitive to iron and silver . The first 2 outings I found small silver rings in wet salt sand at well over 13". However w/ continued use in waist deep salt beaches over the past month the results have produced more small silver rings but no gold at all . Over all the detector works as described but on several occasions the speaker on the side opposit the wireing lost sound untill tapped w/finger. A very good buy for those who are aware that PI detectors do not discriminate. This is my 1st PI unit. Previously I've owned a Garrett Ground Hog, Discovery 3300, Beachhunter ID, and I still have a Whites MXT (The MXT is my "Land" machine). First off, the purchase price is very reasonable (approx. $600 street)for a machine of this caliber. High quality components throughout. This detector is "turn on and go", no difficult settings to master. Waterproof to 100 feet. The headphones are comfortable for extended outings. The control box can be easily belt mounted if you choose. The sensitivity in salt water and wet sand is fantastic. No falsing or instability even with maximum Gain. Pin Pointing is right on. If a target is there the PI will find it. On my first outing with the PI, running the surf line, my first target was a nickel at 12 plus inches. I might add that I was following in the footsteps of two fellow hunters running VLF machines. Anyway, I shortly had 3 quarters, 2 dimes, a nickel, 6 pennies, and a small gold-plated hair clip. Maybe they had their discrimination up too high, but they had swept right over the targets that I recovered. I was only able to hunt for about an hour as lightning started to hit close by and I called it a day. What is the downside of the Surfmaster PI Pro? Being that a PI machine does not have discrimination , you WILL find every bit of metal. There is only one tone used to indicate a target (however the loudness of the tone does vary with target depth), so the decision to dig/not dig is up to you. For me this isn't a big issue as I would always beach hunt in all metal mode on my VLF machines and dig every target. One important decision that you need to make when you purchase this detector is which coil to get. Whites offers a non-weighted coil and a "Zero Bouyancy" weighted version. Performance with either coil is identical. If you plan on being in the water most of the time then I would recommend the "Zero" coil as it does not try to float. If you plan on mostly hunting the wet sand/extreme shallows then the nonweighted is the ticket. Swinging the weighted coil for any length of time on the beach will build up those arm muscles!! It's not that much heavier but you will notice it. One accessory for any water machine that I highly recommend is a "Coil Steadying Bracket" to keep the coil from being flipped up by wave action. The one from Whites is only $10 and well worth it. If you are in the market for a top quality water detector make sure to give the Surfmaster PI Pro a close look. Stirling, N5PIP from Daytona Beach, FL. The Whites Surf-Master PI Pro almost thinks it is a VLF detector. Swing it fast or slow, it will nail targets and deep! It is well made, quite sensitive to gold and pinpointing is right on, 100%! Mine will air-test a wedding band at 13"+! There is no doubt that it is more sensitive to gold than silver or iron. While the Pro is still new for me, it will out-detect my other 3 top-of-the-line water detectors... with ease and speed! (Beach Hunter ID, Excalibur, Infinium). It is so quick to respond to targets too. I believe after time one will learn good targets sounds. I am amazed at how much metal there is in the ground, when using the Pro. The Pro ferretts targets out like nothing I've seen. The Pro is for treasure hunters who are willing to dig more but find the gold! There is no doubt that when the chips are down, reach for a PI Pro! It is almost like a magnet! Call it bang for the buck. I've used this PI PRO two full seasons and I can't be more pleased. It goes deep doesn't everyone say that. I often scoop holes so deep that during the recovery I have to bounce on the scoop to get it to bite then step out and to the side of the hole and pull the scoop out. I'd be over my head otherwise. I've recovered very small thin rings that were approx 1/2 dwt. a small white gold floating heart that was almost 2/3 dwt. The larger gold and platinum wasn't able to hide as well. I use a Fisher shaft weight as I have the lighter coil, works well, minimum effort to keep it on the bottom. If you are going to hunt mostly in the water like me you should consider the weighted coil. Otherwise just get the shaft weight and light coil, if you like to hunt the wet sand too. The PI PRO is not my first choice for dry sand (the big ashtray) as there is usually so much trash & foil I grab a VLF. But dry sand is a night hunt thing for me, while the sharks are feeding. Battery life is fine, I keep track of my time and change them when I get to about 20 hours to avoid having to do it when I'm hunting and the PI is wet. You also should break down and clean the rods after each salt water hunt so they don't freeze. One nice feature is being able to use the edge of the coil to pinpiont or detect crevices in the rocks. You'll hear the SAT doing it's thing as you lower the coil beneath the surface then get it to the bottom where it gets smooth and does not false. It will pick up red bricks though and every piece of junk around. Hey, I've pulled gold, silver and old coins out of the ocean that were under iron. 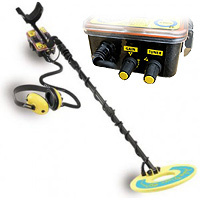 I can buy any detector Aquastar, Excal etc. but the PI PRO performance price break is unbeatable IMHO. So with the cash saved over the other choices I bought a new CZ-20 too. So goes life with a PI PRO...dig it all leave the place cleaner than you found it. You can see some PI finds of mine at Whites web site under customer stories.